Assyrians, Yazidis, Mandeans, Kakai and Bahai leaders vigorously fought the law and their representatives walked out of the Parliament session in protest after it was passed. They had requested to add the following sentence to paragraph 2: “minors will keep their current religion until the completion of 18 years of age, then they have the right to choose their religion” — but this was rejected. The new law, part of the National Card law, is an exact copy of article 21 paragraph 65 of the 1972 constitution of Iraq. It contradicts several articles in the current constitution of Iraq, including articles 2, 14, 37 and article 42. Chaldean Patriarch Sako met yesterday with Iraqi President Fouad Masoum and discussed this issue. The President acknowledged some of the constitutional violations the national card legislation introduced and reiterated that he will make every effort to find a realistic solution to this issue. Chaldean Patriarch Sako meets with Iraqi President Fouad Masoum. Iraqi Women’s Network, comprised of over 90 women’s NGOs all over Iraq. 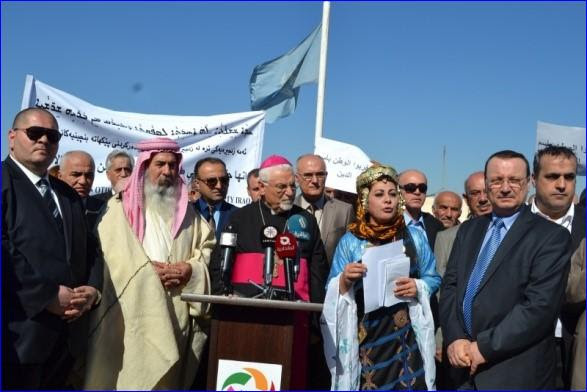 On November 4 a protest was held in front of the UN mission in Arbel by a coalition of non-Muslim groups. Representatives of non-Muslim communities in north Iraq also expressed fears that the parliament of Kurdistan may follow suit. Two weeks ago the lone Assyrian Christian member of the Kurdish constitution draft committee, a woman, withdrew in protest of the radical views expressed by the Muslim members, who showed no compromise towards the civil status law that also forces underage children to follow the religion of their converted parent. My comment: if Kurdistan follows suit, what will non-Muslims do? There will be nowhere safe for them and their children to pass on Christianity, and in the case of the Yezidi and Sabean-Mandeans, some of the most ancient religious teachings in the world. « Islamophobia in the US Christophobia under Islamic Rule: who suffers more?